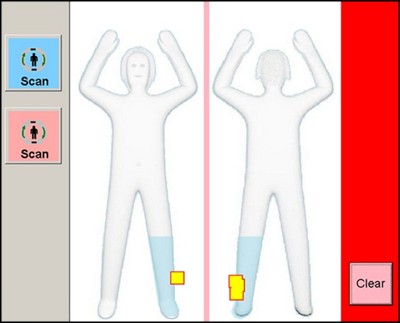 How long did it take the TSA to think of using a generic representation of the human body in place of explicit naked photos? I never felt at ease with the TSA's repeated reassurance that the only person that gets to see the security photos or x-rays whatever the label is a lone screener in a backroom, not because I thought that the screener was a pervert, but because things have a way of getting posted on the Internet without expressed permission from the former owner of those things that get posted on the Internet without prior permission. I'm not claiming anybody's okole is better than the next person, but I still would prefer private parts to remain private. 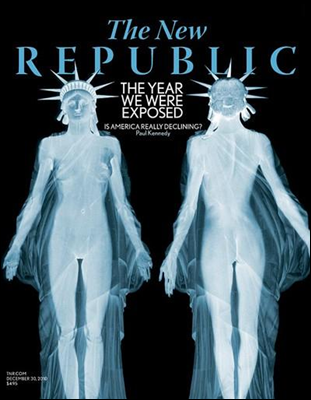 With the older explicit photos, the least the TSA nincompoops could have done was blank out the eyes of the person exposed in the security x-ray, but for reasons all to their own, they didn't. I hate the scanning, and I like to save the word "hate" for only special occasions. After ten years, it's getting harder to ignore the reality that you can easily eliminate half of the people from suspicion just by profiling. No, not racial profiling. Teenage girls who just want to send text messages to their absentee friends and listen to headphones. Anyone who is too frail to fight. X-ray their stuff to make sure no one else planted something in it and let's move it along, please. If you could please fix this, Ron, I'd appreciate it. Ya, Ron. 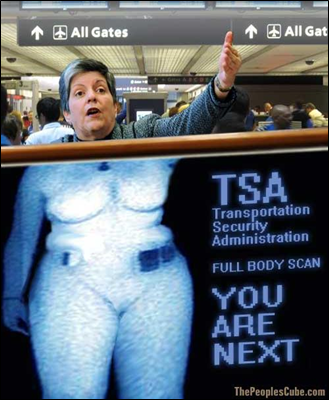 If you could call up the TSA and tell them to discontinue use of scanners and child groin groping, I'd appreciate it too. Seriously, though, I don't think this goes far enough. These scanners are still exposing people to radiation that isn't necessary. I'm hesitant to allow myself to go through one and if asked to, I don't know if I will or not. On the other hand, I would be even more upset if some guy wanted to play with my junk to make sure I don't have any explosives taped to the underside of my scrotum. I would hate it even more if some woman was grinding her palm against my wife's crotch. So, what's worse? Exposing yourself to potentially cancerous radiation or letting yourself and your family be molested? Not really a good option there, unless you just give up flying altogether. Oh tooooo funny, Ron! But serious! I did ask not to do the body scan the first time, not just because of the privacy thing, but I just didn't trust the radiation or whatever that they kept saying was so very, very safe. Whatever the case, if you don't do the scan, you have to WAIT forever for somebody to come and do the hand search. This is in Hawaii. I don't know about elsewhere. I agree about profiling. The Israelis have done it successfully. We could learn from them. Art was ticked at the TSA when we were going through to come to Chicago. He had on a plastic belt so it wouldn't set off the monitor. The TSA person insisted he take it off. He showed them that it was plastic. She said it still had to come off. So he asked to go through the metal detector monitor and she said no..."because I chose you!"